Glass balustrades are growing increasingly popular and are a great option for commercial buildings, new modern homes or for home renovations. Not only do they add value to your home, but they offer a contemporary look that has become synonymous with luxury, high end homes all over Sydney. Additionally, using glass balustrades in your home allows you to create an illusion of additional space and helps you enjoy magnificent views without having to sacrifice on security and safety. We all know that space is a premium in Sydney, so this one addition can make a big difference if you are planning on selling down the line, or if you simply want to lounge around in your balcony and take in the views. When choosing a company to install your glass balustrade system, you need to choose carefully and take the quality, style and durability into consideration. You should choose a company that uses quality products, and is based locally. The great news is, Avant-Garde Glass is based in Sydney – with offices in Gordon and Blacktown. Put simply, we aren’t going anywhere! Our installers have the relevant licenses, required in the state of New South Wales and we only use the highest quality materials – making sure that there are no issues down the line. Our balustrade glass is heat soaked, reducing the presence of nickel sulfide (NiS) inclusions – an inorganic compound that, if present, has on rare occurrences led to glass breakage. Our glass is of the highest quality and has been tested thoroughly to withstand the harshest of environments. Being an Australian company, all our products strictly adhere to Australian standards and regulations. 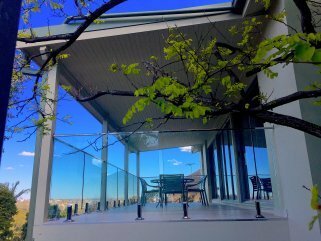 All our glass is regulated to Australian standards of AS/NZS 2208 and the Building code of Australia’s balustrade regulations. Furthermore, all our glass is laser cut with smooth polished corners, which has the dual purpose of aesthetic appeal and safety. We offer different varieties of balustrades to suit your particular taste and the overall décor of your home. The key that we have found is to keep the area opened so as to not disrupt the flow and view from the balcony. There are a few solutions that we offer that will make this vision a reality. Our customers all over Sydney love our frameless balustrade range, for its elegance and the modern feel it brings to their homes. This range of balcony fencing incorporates the durability of 2205 stainless steel spigots (the highest grade of stainless steel spigots on the market), with the stunning beauty of frameless balustrade panels. It is the most affordable of the frameless range, and is also the most sought after by all our customers in Sydney. This is another customer favourite in Sydney. It allows for the floor space to be maximised due to the glass being fitted on the face of the balcony. Land and floor space is at a premium in Sydney, so it’s no wonder our customers want to take advantage of the side fixed option. This system utilises stainless steel standoff pins to fix the glass on to the side of your balcony. This is usually incorporated with either stainless steel top rail, or floating hand rail – a legal requirement for any balcony that is over 1m above the ground level. 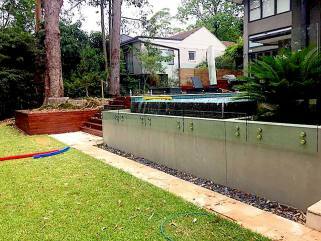 Yes, we even offer semi-frameless balustrade installation to our customers based in Sydney. This is a great option for those looking to have commercial balustrades installed in their apartment blocks. The system works by having the glass panels sit in between two aluminium posts – allowing for a mostly uninterrupted view over the balcony. Are you looking for a commercial balustrade installation? We can help! Our team has worked on commercial projects such as a balustrade installation at UNSW and Westfield, Chatswood. All our materials are of the highest quality, and meet the strictest of the Australian standards for Balustrades. If you would like to talk to our team about how we can work together, fill out the contact form below and we will get back to you as soon as possible. So what type of finish do you prefer? 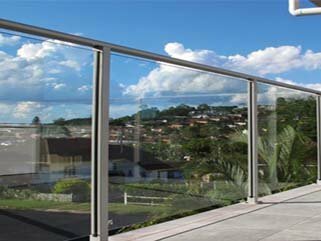 Our balustrade system selection is vast and adaptable to suit Sydney homeowners vast and unique tastes. Once you have your heart set on a specific design, you need to choose a finish. Our stock glass panels (hence the most affordable) come in the clear, transparent style as that is the most sought after in the market. We do however offer a variety of finishes in our glass if you prefer to go that way such as frosted and tinted glass. These are great options if you are looking for privacy glass, and has the added bonus of looking sleek and stylish too Whether you need beautiful transparent glass or opaque privacy glass balustrades for your Sydney home, there is no question that frameless panels are the ideal option. 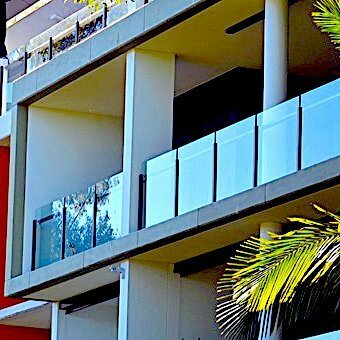 We offer sophisticated glass balustrade solutions throughout Sydney. From the initial quote, we will consult with you on the ideal layout of your balustrade fence to both maximise your living area whilst staying compliant with all the relevant regulation requirements. Once we can come up with a solution that both fits your vision and meets the relevant required standards, we will go to work on the installation to make that vision a reality. Whatever you require, we have the solutions to best suit your space and we have the expertise and experience to execute that plan – offering you a stunning frameless balustrade. Need more convincing? Our glass balustrade solutions are highly sophisticated and have been used on different projects from high-rise apartments to residential houses. We have worked on commercial projects such the University of New South Wales and have worked with a variety of home builders throughout Sydney. Our professional, specialized team of experts handles everything from the supply to installation of glass balustrades. If you choose our service, we can assist with all projects from the design stage right through to the final installation.